‘Brexometer’ is a name coined to gauge the impact of Brexit on the world, on the UK’s economy in particular. Here at Brexometer we publish Brexit related content from different sources all across the board. Can the Tories and Labour agree on Brexit? Cross-party talks are continuing in Whitehall, amid parliamentary deadlock over Theresa May’s Brexit deal. So what are the sticking points and can Labour and the Conservatives reach an agreement? Behind the scenes, the prospect of a deal, while difficult, is not impossible. There is a big incentive for both sides to reach agreement: the avoidance of next month’s European elections. Prime Minister Theresa May doesn’t want to give a platform to parties such as Nigel Farage’s new project which could appeal to Brexit-voting Conservatives. And, frankly, some of her own activists would be conflicted over how, or whether, to vote. For Labour leader Jeremy Corbyn, awkward questions about a second referendum could be ducked if there is no election campaign. So the talks are serious and not just political window dressing, and the fact that Mr Corbyn and Mrs May met on Thursday is significant. 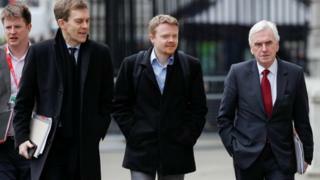 The Labour leader’s policy guru Andrew Fisher joined shadow chancellor John McDonnell for the cross-party talks on Friday. But, as I understand it, significant hurdles remain. Some of the detail of possible changes to the Political Declaration – the blueprint for the UK’s post-Brexit relationship with the EU – is being discussed. But sequencing is a problem. Labour wants to discuss legally binding changes to the document, future-proofing it, where possible, against a change of Conservative leader. Broadly speaking, the government would rather do “the easy bit” first – discussing legislation to protect workers’ rights. Resolving this tension is key to a deal. Labour is also keen to secure agreement on a customs union. It is flexible on what it would be called – an “arrangement”, for example – and Mrs May hinted on Thursday that the two sides were close on this. But they are not yet close enough. The definition of what a customs union/arrangement does is vital to the Labour side. But the main constraints to a deal may come from Mrs May and Mr Corbyn’s parties, rather than their negotiators. New Forest #Brexometer CHANGE OF VENUE AND TIME. Hopefully see you there and will rearrange Brockenhurst shortly. @ForestJournalUK we’ll be in Brockenhurst this Saturday 20 April from 11-2pm opposite Tesco’s for the New Forests first #Brexometer to gauge local #Brexit views. Come along to our New Forest #Brexometer.